Is remote working the future for business? In previous articles I have talked about how technology and business interact, and what the future of technology might hold for the world of business. In this article I am going to explore the idea that in the future, almost all business will be conducted remotely. The number of people who permanently work at home in the UK, (known as teleworking) was estimated to be 1.3 million in 2010. The working population of the UK at the same time is believed to be around 30 million, therefore around 4.5% of the UK’s population (in 2010) were teleworkers. That said, is is estimated at the same time that 3.7 million UK workers sometimes worked from home, and sometimes went into their place of work. That means that of the working population, around 12.5% were, at some point, working remotely. The figures are similar for the USA, and other developed nations. More and more firms around the world, are offering their employees the opportunity of working from home, but why? Many people do not realise it, but it is often much cheaper to give employees access to the technology they need to work at home, than it is is to provide them with a workstation in an office unit. Yes that might mean you need to buy every employee a laptop, printer and make sure they have an internet connection, however that is often much cheaper than maintaining a workstation, in a fixed location. If employees work in an office, then the firm either has to purchase or rent the premises – this can be very costly. Furthermore, an (often very expensive) IT mainframe system needs to be in place, to ensure that the entire building is connected internally, and with the outside world – including offices in other locations. Most employees will need a computer to work at, so why not buy them a laptop, give them their own printer, make sure they are internet connected, and tell them to work from home? It is often much cheaper. Improvements in technology mean that working from home is more viable than ever before. Thanks to online storage systems, which allow simple, easy and effective file sharing among workers, employees are able to connect with each other, and share data from almost anywhere in the world. Outsourcing such tasks is often a much cheaper option for firms, than maintaining their own expensive IT infrastructure. Advancements in communication technologies have also improved the viability of teleworking. I have previously wrote about QB Robots, robots which are effectively your eyes and ears in the office, which you can remotely control, whilst you are not in the office. These sort of devices mean that you can still connect with other workers, almost as if you were there in the room with them. 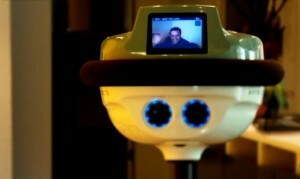 You don’t necessarily need a QB robot to stay in communication with others though. Technologies like webcams, and VoIP mean that it is really easy to stay in contact, and in the loop, so you are just as up to date, as you would be, were you in the office. Technology has made it easier to work remotely, and it is often cheaper, but another advantage of teleworking, and a reason which I believe will be one which causes further growth in the industry, is the improvements in accessibility that teleworking offers. In his recent article ‘Five changes in video conferencing for the next decade‘ Rashed wrote about how improvements in connectivity could improve the prospects for services like telemedicine. Being able to connect to people remotely, means that those who live/work in more remote areas, are more likely to be able to become connected. Many studies have shown that working from home can actually boost productivity and reduce the time employees take off ill.
British Telecom claims that its teleworkers save it an average of £6,000 per year (per worker) due to the reduction in the costs of having to provide a workstation, the reduction in commuting costs, and through the increases in productivity. BT claims that its teleworkers are 20% more productive and take fewer sick days. This is probably due to the reduced stress associated with working at home, due to employees not needing to deal with the hassles of commuting, and the occasional hassles presented by co-workers, arguments and misunderstandings can cause stress! In addition to this, the less time employees spend commuting, the more time they have to themselves, and the more time they can spend working. Say an employee spends an hour and a half commuting each day (two 45 minute journeys) then they could spend an get an extra 45 minutes working, and get an extra 45 minutes to themselves. To conclude, working remotely is often a much cheaper option for both firms and employees, it has been made more viable thanks to technological improvements, it can improve the services that a firm can offer, and also improve the productivity of the workforce. These are some of the reasons, why I believe teleworking will become much more common in the future. Teleworking is quite popular in western countries and its getting popular in Asian countries as well. The best advantage is that you can work from home and employers get cost reduction. There are a lot of benefits of teleworking and with todays technology it is relatively cheap to do. One disadvantage however is that a lot of people really need the social interaction that you get from being in an office. In my previous job I used to spend about a month out of the office each year and I found that after a week or so having to communicate via email and phone really started to wind me up. That is a good point Neil, if we all sit in front of screens all day, where do we get that vital social interaction we all need? Don’t get me wrong, I’m all for teleworking and the benefits that can be gained both personally and commercially. My feeling is that a lot depends on the type of role that is involved and the personality of the individual. If it is a management level role then it is a lot harder to interact with your peers or workers and it can be a lot more difficult to read situations without actually being there. If the role is more defined with specific tasks that need to be completed then in my view it is easier to adapt to teleworking. Telecommuting or teleworking is growing for many of the reasons you stated, Christopher. I have worked from my home for a over a year so I can personally vouch for the less stress, more productivity and saving time that can then be used both for business and personal time. I think the lack of social interaction is probably a bit of a disadvantage. However, if you have a spouse, children and a few good friends you actually have the time and energy to build those relationships a bit better. Perhaps joining groups of people who are either in the same business or enjoy the same hobby as yourself could help in having ample social interaction. There’s also the added benefit of using less gas and creating less noxious fumes from driving back and forth. My family eats more healthy food in general now as well, because I’m home and can cook from scratch more often. The only question left is what are we going to do with all of those empty office buildings when 75% of the population teleworks? Maybe we could create schools where disadvantaged people could get free training on how to work from home! It is always interesting to here from first hand examples Darci, and it is good to know that you are in favour of it. If we are no longer using the offices, I suppose we could knock down and build houses to stop expansion onto greenbelts and save our countryside! Actually, knocking them all down and building houses is a great idea. Or how about knocking them down and creating new open spaces for wildlife! These are interesting possibilities, Christopher!